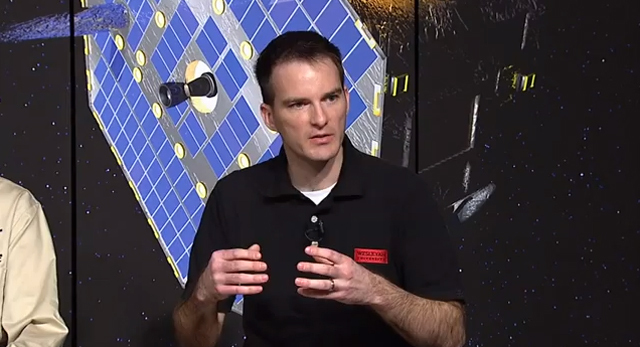 Seth Redfield, assistant professor of astronomy, speaks at a press briefing about NASA's IBEX (Interstellar Boundary Explorer) spacecraft, which sampled multiple heavy elements from within our solar system and beyond. IBEX found some astonishing data in the process. Seth Redfield had to cut short his first Astronomy 224 class of the 2012 spring semester, but he had a good excuse: he was presenting at an international press conference being held by NASA on one of its recent missions. 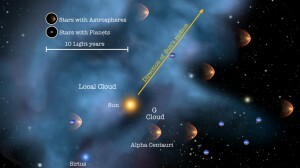 Redfield, an assistant professor of astronomy, was chosen by NASA to be a non-mission expert to help verify results from the space agency’s ongoing IBEX (Interstellar Boundary Explorer) mission, an unmanned probe that analyzes the interstellar boundary that protects much of our solar system, including the Earth, from deadly cosmic rays from interstellar space. 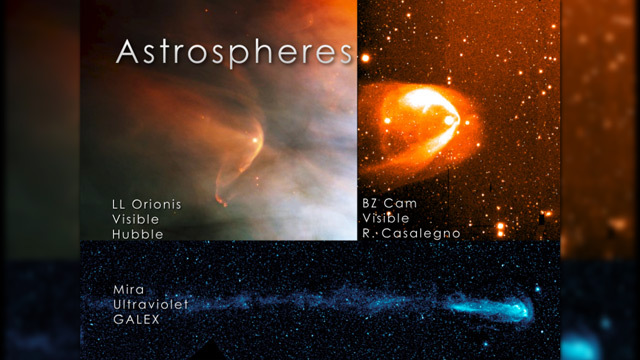 The heliosphere, according to Redfield, is essentially the balance of the outward moving solar wind, which can travel upwards of a million miles per hour, and the compression of the gas and dust within it. 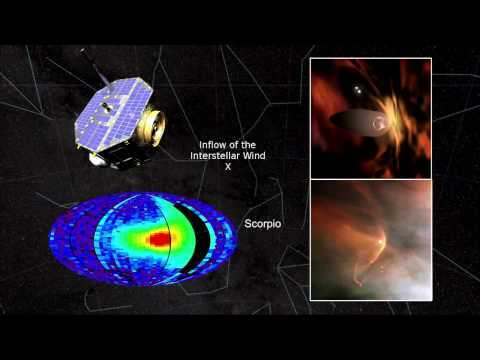 It changes with time and our position with regards to the heliosphere and the interstellar boundary is important. An illustration of our solar system's interstellar boundary and other astrospheres from the IBEX press conference. In fact, some have theorized that the earth moving outside of the interstellar boundary may have accounted for mass extinctions in the distant past, though Redfield is quick to point out that no hard evidence has yet been found. The notable evidence that IBEX did uncover is extensive. First, it helped establish Earth’s relative location within the heliosphere and interstellar boundary, and provided information on Earth’s past and projected future paths through the boundary. IBEX also provided reference points that can be drawn upon as scientists begin to study similar structures around other stars. IBEX also offered researchers their first up-close look at particles of matter that came from outside our solar system. While theories previous to this analysis had long held that this matter would be substantially the same as the matter within our solar system, the data revealed a stark difference. Redfield discussed the interstellar medium, our heliosphere and "astrospheres," during the presentation. Redfield’s work has been taken up by several of his students. Greg Malamut ’12, has been studying ISM using time booked on the Hubble Telescope. Graduate student Katie Wyman ’11 has also been doing active research with Redfield on the heliosphere. The press conference was covered by media from around the world and Redfield’s comments were captured in part in a National Geographic article. As for his Astronomy 224 class, did he think they minded that he had to truncate their first meeting?